Mountain-laurel is in bloom in the Laurel Highlands! The shrub keeps its foliage year-round, but keep an eye out in May and June for umbrella-like flowers that range in color from white to pink, with unique purple markings. 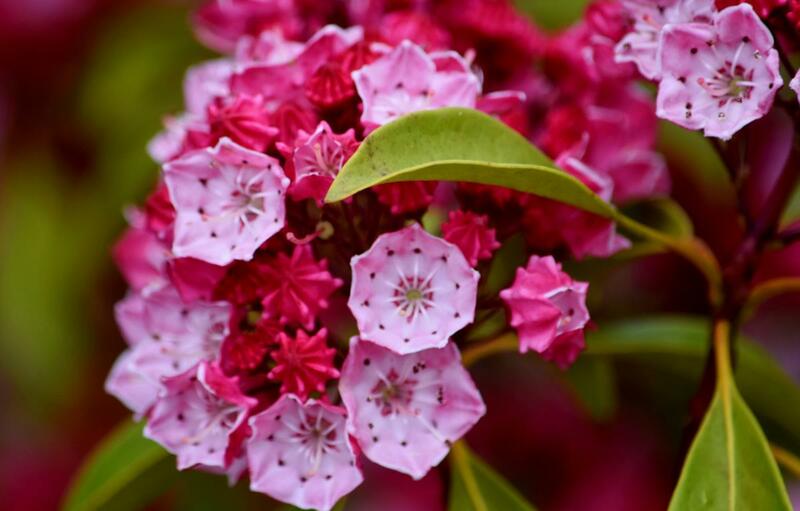 Not only is mountain-laurel absolutely beautiful, it is Pennsylvania&apos;s state flower and can be found all over the Laurel Highlands. Want to see the spring flowers yourself? Lucky for you, they can be found right in your backyard! While a backpacker or day-hiker can find many opportunities to gaze at the glory of this unique and beautiful plant, one of the best spots to view mountain-laurel on the entire Laurel Highlands Hiking Trail is via the Route 30 trailhead just outside of Ligonier. If you park at the trailhead parking lot, you’ll see the lovely flora right away. You can hike north or south to see blooms lining the trails at a few different points. Close by the Route 30 trailhead is Forbes State Forest/Laurel Mountain. This area is renowned for hiking, mountain biking and when conditions provide, excellent cross-country skiing. But in June, it is where hikers and bikers can take in the beautiful sights and sounds of a high elevation forest. Explore the Rocky Gap, Wolf Rocks and Silvermine Trails for the best chances to see mountain-laurel in bloom! Bonus points: visit nearby Spruce Flats Bog and Linn Run State Park for even more unique and gorgeous scenery! A local gem and beautiful trail offering a nice loop hike or mountain bike ride past large rock outcroppings, beautiful overlooks and remnants of homesteads. Find the best display of mountain-laurel from the top of the loop from Fire Tower Road, or via a steep climb from the McCune Trailhead. A great place to get off the beaten path, Quebec Run offers a variety of trails known for hiking, mountain biking and trail running. These trails are challenging and this is an area where you are less likely to run into other trail users. Enjoy the lush rhododendron and peaks of mountain-laurel as you weave through this rugged landscape. Check two things off of your bucket list by viewing mountain-laurel at Frank Lloyd Wright&apos;s Fallingwater! It&apos;s only perfect that this beautiful flower can be found in the surrounding landscape of the architectural masterpiece. As if Fallingwater wasn&apos;t picturesque enough!